Has anyone asked how many of these pupils have moved to an English school or independent school? A total of 945 young people were taken off the school roll in Wales before taking their GCSEs in 2018, official Welsh government data confirms. All Welsh schools must provide details of their pupils electronically in January each year. This is collected in the Pupil Level Annual School Census (PLASC) and the data is published online in July. The data submitted by every school is authorised by the headteacher and validated by the local authority. Schools take great care to get this data right when they submit it. The data is very important to every school. It is the only official determination of how many children are present at the school, their age and their year group. It matters to the funding the school gets. It also officially confirms the number of pupils who are expected to sit examinations such as GCSEs and, when the results are in, it helps determine how the school has performed. The latest PLASC data shows that there were 29,870 pupils age 15 (year 11) on census day in January. PLASC data for 2015 shows that there were 30,815 pupils age 12 (year 8) in January 2015. It means that 945 pupils fell off the school roll as the cohort moved from year 8 to 11. Closer scrutiny also shows that the drop in total pupil numbers was most dramatic as pupils moved from year 10 to 11 (age 14 to 15). The data shows that 750 pupils came off the school roll as they moved into year 11. That’s 80 per cent of the change in total pupil numbers between the age of 12 and 15 (for the class of 2018). Furthermore, the drop in the number of pupils on roll between year 10 and 11 represents 2.5 per cent of the entire cohort. Transitions from age 14 to 15 in the two previous years also showed significant drops in pupils on roll – 540 pupils coming off roll in 2015/16 and 2016/17, representing 1.6 and 1.7 per cent of the total cohort respectively. 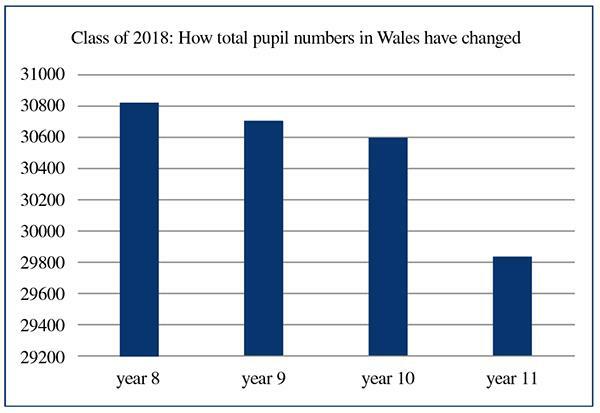 These figures show a growing trend of pupils starting but not finishing secondary school in Wales. Approximately 32,000 pupils enter year 7 each year across the 195 secondary and 13 all-through schools in Wales. As such 945 pupils represents about three per cent of the cohort of pupils that start secondary school. The Welsh figures come after concerns have also been raised by England’s inspectorate Ofsted about the “off rolling” of pupils. An analysis published in June found that more than 19,000 pupils who were in year 10 in 2016 disappeared from the school roll by the start of year 11. Half of these pupils did not reappear in any state school. Ofsted’s analysis shows that of 2,900 schools that lost pupils between years 10 and 11, 810 lost five or more pupils and 300 had “particularly high levels of off-rolling”. Ofsted has said it will use this data to help “focus attention at inspection” in schools with high numbers of pupils vanishing. It is also to work closely with FFT Education Datalab to look at how performance data is affected in the schools in question. Back in Wales, this year secondary schools have been measured by new, purposefully more stringent, performance measures. These measures are used to judge school effectiveness in consortia-led school categorisation and Estyn inspections. In 2018, schools are still judged on the performance of students gaining five GCSEs at grade C and above including English or Welsh and maths. However, for the first time, there has been a limit of two GCSE equivalent qualifications in this measure. In addition, schools are measured on the numbers of pupils achieving at least two GCSEs in science, the numbers of pupils gaining the Welsh Baccalaureate Qualification (the Skills Challenge certificate plus five good GCSEs including English and maths) and “Capped 9”, the point score of the best nine qualifications that must include English, maths and two science GCSEs. These performance measures are designed to be much more challenging for schools, and pupils, to achieve. In an average Welsh secondary school, there are around 150 pupils in each year group. Each pupil would be worth approximately 0.7 of a single percentage point in performance measures. Two pupils that do not achieve five the A* to C GCSE or more can make a 1.5 per cent difference – negatively – in headline school performance measures. It means that margins matter in school performance measurement. But many will ask if it has come to matter too much if it might explain how so many young people went missing off the school roll. In England, meanwhile, the Department for Education (DfE) has asked Edward Timpson to conduct a review of school exclusions, which it is expected will include a focus on illegal exclusions and “off-rolling”. An inquiry by the children’s commissioner for England in 2013 found that thousands of students were being illegally excluded through techniques such as being placed on “extended study leave”, part-time timetables, or in “inappropriate and questionable quality alternative provision”. Robin Hughes is the former Wales secretary of the Association of School and College Leaders.